In a large saucepan set over medium heat, cook bacon until crisp. Transfer the bacon to a paper towel to drain. When cool, crumble the bacon and set aside. Add butter to the bacon drippings in the saucepan and turn the heat up to medium-high. Add onion and apple, and sauté for about 5 minutes. Add celery and leek and 1 large leek. Sauté for an additional 5 minutes. Add garlic and sauté for 1 minute. Add sweet potatoes and add to the onion mixture, along with chicken broth, cinnamon stick, and nutmeg. Bring to a boil. Reduce heat and simmer uncovered until potatoes are tender, 20-25 minutes. Remove and discard cinnamon stick. Working in batches, purée the sweet potato mixture in a blender until smooth. Return the soup to the saucepan. Add 1 1/2 cups half and half and maple syrup and heat, stirring frequently. Season to taste with salt and pepper. 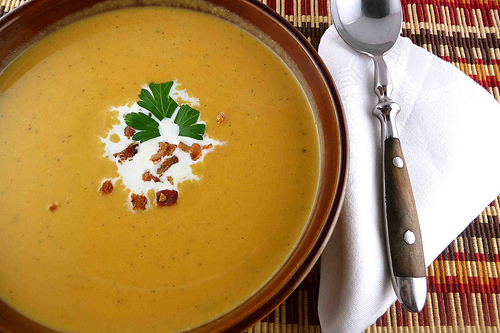 Ladle the soup into bowl and garnish each serving with 1 tablespoon of half and half, and crumbled bacon.